Rayburn was a protégé of Vice President John Nance “Cactus Jack” Garner, and a mentor of Lyndon B. Johnson. Many historians believe Rayburn maneuvered the narrow House vote that prevented a drastic reduction of the U.S. military only months before Pearl Harbor was attacked in 1941. Rayburn supported Lyndon Johnson’s presidential candidacy in 1960, and warned LBJ not to accept Kennedy’s offer of the vice presidency. Rayburn considered Kennedy callow and opportunistic, but he loyally supported JFK and his legislative program in the first few months of the New Frontier. I watched a television interview in early 1961 in which Rayburn was asked if thought Kennedy would be a great president. “He’s a young man of destiny,” Rayburn replied, which was an adept evasion. Even so, I accepted it as a great compliment for the untested president. Back then, I thought all Democrats were friends. 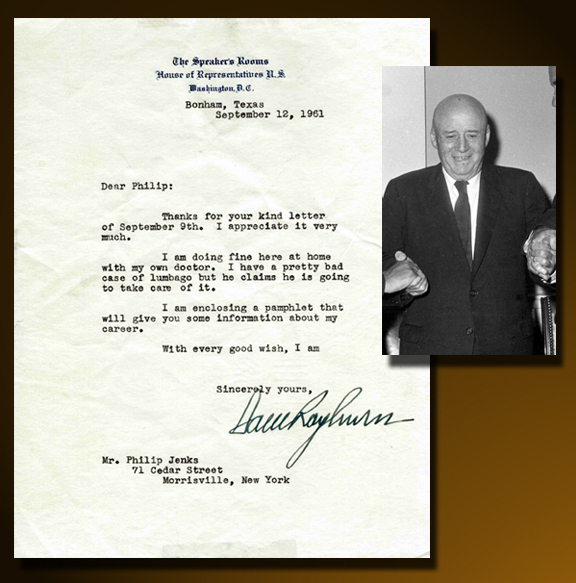 In September 1961 Rayburn’s office announced he would take a vacation in his hometown of Bonham, Texas to be treated for lumbago. Sam Rayburn died two months later of cancer. His New York Times obituary on November 17 said he was told on September 27 – 15 days after this letter was written – that he was terminally ill. If his letter to a teen-aged non-voter in New York State is any indication, Mr. Sam kept working until the end.